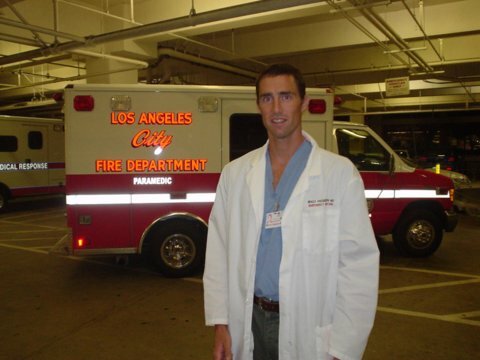 Dr. Pregerson, the “Safety Doc”, a Returned Peace Corps Volunteer and winner of the 1995 Wise Preventive Medicine Scholarship currently works as an Emergency Physician in Southern California. He continues to have a strong interest in the prevention of illness & injury through community education in both the written and spoken word. He has extensive speaking experience, has given lectures to a variety of community groups and has been interviewed on KROQ, KFMB and local television. The ER or the ED? It is much more than just a room. I work in a 45-bed department equipped with modern technology and hundreds of people who make caring for those in need their career. The proper term these days is the Emergency Department rather than the Emergency Room. Some emergency physicians feel that proper terminology should be used in order to emphasize the fact that medicine’s newest board certified specialty is no longer just a “room” or two staffed by moonlighters trying to make a few extra bucks while they are establishing themselves in other specialties. Today’s emergency physician is in it for the long haul. This is our specialty and we are proud of it. Personally I have never been much of a stickler for titles, and I never take offense when a patient asks me what I am going to specialize in. I simply tell them that Emergency Medical Care IS my specialty. For some people it will always be the ER, but in writing my books I have decided to use the proper terminology, the Emergency Department. Hence the abbreviation ED, which is used throughout.